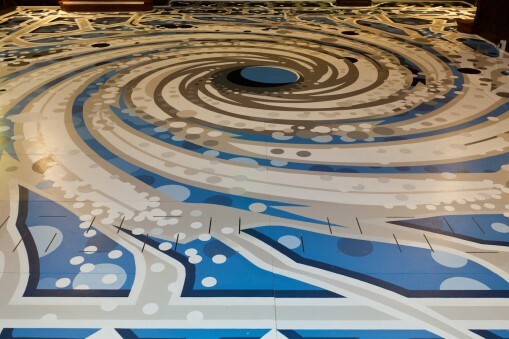 Tod Hanson has been making large-scale public realm artworks since 1995. A busy ‘working artist’, he has been commissoned by organisations as diverse as the National Trust, Commissions East, the Queen Elizabeth Olympic Park, and Day + Gluckman. 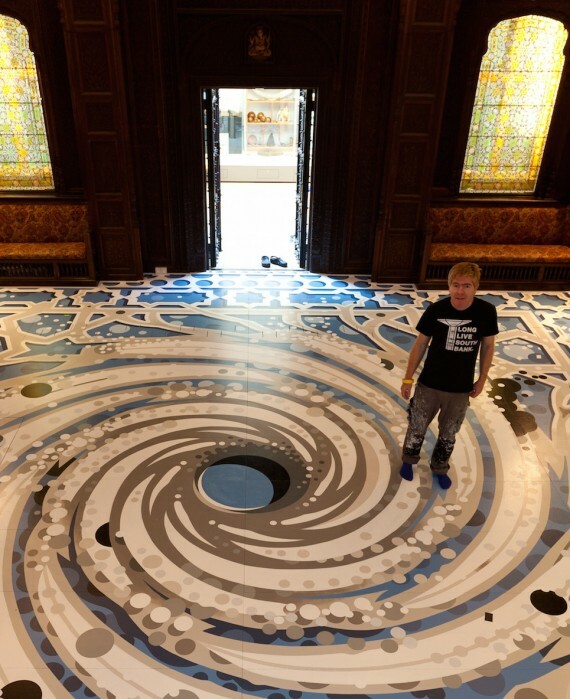 Working in both two and three dimensions, he employs a symbolic painted language of dots, tracks and streamers. Distinctive and recognisable, his work owes a lot to graphic design and the notion of the decorative but transcends these descriptions, always taking charge of a space, dynamically animating run-of-the-mill architecture or interior design. The result is always something more vivid, organic and interesting. His latest commission is part of the Coastal Currents programme in Hastings. 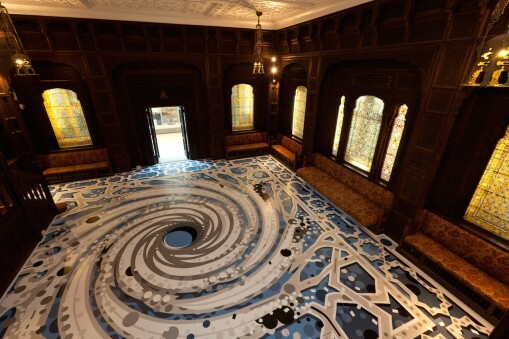 During a month-long residency, he has created an enormous site-specific work that covers the entire floor of the historic Durbar Hall in the Hastings Museum and Art Gallery. The Durbar Hall is striking in its recreation of Indian colonial interior architecture, with stained glass windows, dark filigree woodwork and flowered upholstery. 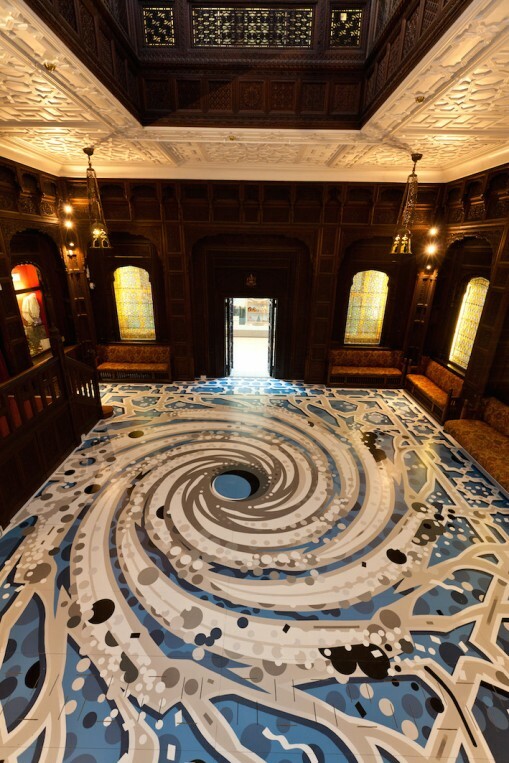 Working with floor paint on chipboard, Hanson has created the illusion of a vortex at the centre, exuberantly swirling out to the edges of the room in shades of blue and tan, creating a visual contrast with the static brownness of the hall. How did this residency and commission come about? I was asked if I would be interested and I was, so I came on a site visit. I loved the museum and space. My first thoughts were about what I could do that would challenge the space while still fitting in. I realised that the tornado-swirl-vortex motif would work. It’s quite a heavy room and I thought it would lighten it. What gave you the vortex idea? Is it a motif you use a lot? In my work, there is a landscape thing going on and a machine thing going on, along with the idea of movement through time. Because the Durbar Hall also has a gallery where you can look down on the room and any work in it, it made me think of the idea of looking down on the world, because of the artefacts and style of the room. GEO stands for Geo Stationary Earth Orbit; I’m interested in space technology as well as antiquity, two ends of the things we make, of our passage through time as well as through the world. I took many photos of the museum and its collections, and then played around on the computer with the images. I blew up a section as printouts which I transferred onto the chipboard base. The dots came afterwards. I like to take things that are quite ordered and supercharge them up. I originally studied graphic design and then did a public art MA at Chelsea. But as a kid I wanted to be a comic book artist, so in a way I’m using some of the modes of that genre, like using panels seam to seam. Tell me about the motifs that appear regularly in your work – the dot, the tracks, the streamers? They just arrived and then you realise that you have this language. About 10 years ago I did a show at the Globe Gallery in Newcastle and realised that the marks were interchangeable at different scales. So you can play with them. You explore and take them further, and if they work you keep them on board. I use shapes and forms that I call tracks, dots and streamers. Those are taken from different graphic artists, like Jack Kirby – one of the greatest comic book artists – who used ‘whiz lines’ to denote energy. The dots are like bubbles, spheres, holes in the ground. Symbolically they can move anywhere between the microbial and the cosmic scale. I’m also interested in circles as symbols of how the world is mechanised. A lot of the forms I make are round, factory production-type things. The whole Apollo space thing originated my interest in streamers. I like the idea that they are destructive, ruinous, but can also be celebratory. If I want to ‘speed up’ a piece, add dynamism, the streamers are a way of doing that. Tracks are like the infrastructure, the channels, the roads. They often form the ordered underlying structure; I start with them and then layer the streamers and dots on top. My biggest influence was a shelf of books about popular illustration in my dad’s bookcase. Seeing Keith Haring‘s work and some of his interior spaces had a strong effect on me. Also discovering the mindscapes of Roberto Matta was important. They seemed to hold an awful lot of ideas that could potentially go off in all directions. You’ve talked quite a bit about the symbolism of your work, but there are many formal qualities as well. I like frames, which give an understanding of a first viewpoint. It goes back to my interest in comic books, and the proscenium arch. I am somewhat interested in illusionistic space. A space beyond a space, making walls into punctured screens that you can see beyond, a kind of baroque trompe l’oeil. The void in the centre of this piece is a device to represent the eye of the storm. There is a tendency for me to make symmetrical things; I’m always struggling a bit with that, I want to break things up. You work on a very large-scale, which must take confidence and experience. How did you build up to doing such large works? My parents worked in the theatre, and my dad taught scenic construction. When I was young I was used to seeing small drawings that were turned into large pieces of scenery. I did graphic design and realised that I could set my own brief. Then the public art MA was a bridge for me to start doing larger works. I used to do some work decorating nightclubs so I realised that I could paint on a large scale, and after my MA I worked for Greenpeace from 1992-1995 doing big works for them. It’s a slow transition; you grow in confidence as you do it and if people appreciate what you are doing. The thing about big pieces is that each piece builds, gains a momentum. It’s like a mountain that you climb, and it starts to take you over. It’s terrifying, but exciting and really satisfying. The sensations are very strong but when it is going well – which is not usually ’til 80-90% of it is done – it becomes very exciting. You start it rolling and then it starts to move you. Two things happen. I slow down. I spend more and more time looking at the work and deciding where the final pieces go, and eventually I realise, that’s it, it’s done. And sometimes, like now, I’m just stopped by the bell. Quite often, I’m working ’til up to an hour before the opening! But that’s the nature of public art.